6 days. Hard to believe that after all the runs and miles we are now just 6 days away from the New York City Marathon. Sunday was a pretty uneventful final medium long run of 10 miles. One of the most enjoyable runs of the training cycle I took to the hill route and locked in at an easy pace just under 8:00 minutes/mile. There was nothing to gain by going faster as any training gains take approximately 13 days to manifest themselves – long after race day will have passed. I worked on perfecting my race pace on Saturday – mission accomplished, so it really was a matter of just capping off a 37 mile run week and getting ready to taper hard this last week leading up to race day. I will run 3 miles on Tuesday morning, 4 miles on Wednesday after we get to New York and then completely rest on Thursday and Friday. Saturday morning I will leave the hotel, walk up to Central Park and run my final 2 mile shakeout that will cover the final 2 miles of the New York Marathon Course. A day later I will push through those same two miles, cross the finish line and will be a New York Marathon Finisher for the first time. This week is a tough one for the marathoners as race day jitters build day after day while your usual way of managing stress and anxiety is cruelly taken away from you. Little to no running as the final week of the taper allows your muscles to fully recover and your Glycogen stores to top themselves off in preparation for a long, tough race on Sunday. As of Monday I am very calm and I feel very prepared. I have a little bit of a cold that I am hoping is 100% cleared up by race day and I need to load up on my sleep this week as best I can, but other than that things are about as good as they could be from a physical and mental standpoint leading up to race day. With one lone exception back in July we ran every single workout that we intended to preparing for New York. 98 runs covering 997 miles on our way to the starting line – we have never been better prepared for the marathon. On Sunday as the sun was rising over the Brushy Creek Trail I took some time to think back on this training cycle. One thing that leapt out at me was the fact that only twice during the entire ramp up to race day did rain fall on me during a run. Just a brief sun shower on a Sunday morning in August that lasted less than 10 minutes and a rather miserable 2-mile shake-out run prior to the Denver Half-Marathon three weeks ago. Other than that it was a dry and hot training cycle. The hottest I can ever remember. Hopefully the weather on race day will be similar to what we had here in Austin on Sunday – 49 degrees and light winds. The forecast looks promising for Sunday, but we have a long way to go before that becomes clear. When I pack for New York tomorrow I will make sure I am ready for anything from 39 or 40 degrees up through 60 for the race. Hopefully we’ll be running in shorts, our Team USA singlet to elicit some support from the hometown crowd along the course and a light pair of gloves. Perfect. Our nutrition and hydration plan is finalized, our pacing strategy is committed to memory – now it is just a matter of determining if 3:00 pace or 3:05 is where we need to be. Frankly it looks like that is our window of opportunity right now. By going for 3:00 hours there is a risk that the pace will be too rich for our blood and we will crash hard over the final 10 kilometers, making finishing at even 3:05 unlikely. If we start tentative and shoot for 3:05, we may run a strong, strong marathon, never hit the major hurdles to climb at mile 22 through the finish, but never have a shot at reaching our goal of 3 hours. It is a tough decision, one which I will be thinking about and re-thinking about every day until Sunday morning. But whatever we decide to do on race day, I need to be 100% committed. That is the way the marathon works. There is no room for doubt and no room for questioning your decisions. You make them the best you know how, internalize them and make them your own. Then you go out and ignore all of the indicators that this is too damn hard. In a 5K the final mile is a killer. In a 10 Kilometer race, I start feeling bad around the 4.5 mile mark. In the Half-Marathon, things get pretty dicey around mile 10 and you just keep pushing through to the tape. The marathon is a see-saw battle. You feel good/great at the start, not so great in the middle, you regain your strength in the latter portions of the first 20 miles and can recover that earlier feeling of invincibility. Then the miles seem to get longer, your legs seem to get heavier and the thought of running another 4 or 5 miles seems to alternate between ridiculous and absurd. At this point you need to disassociate yourself and focus on small incremental achievements – making it to the next water stop, the next time you will take some gels, the top of the next hill, the turn onto Central Park South, Columbus Circle, the grandstands on the right where Dawn and Landry will be rooting for their marathoner and finally the finish clock as you squint into the sun to try to make out the hours, minutes and seconds. Crossing the mat is the briefest of accomplishments. It takes less than a second, but it stays with you forever. 6 days. As Dom would say, time to go to work. Saturday morning I had a short 6.2 miler on the schedule, the same distance I ran on my very first workout of NYC Marathon Training back in June. Same distance but a very different workout. Back in June I was just getting things started, I had 98 more runs ahead and just under 1,000 miles to go before the starting line. Today just tomorrow’s 10 miler at a relaxed pace and three more short runs on Tuesday, Wednesday and Saturday totaling only 9 miles are all that are left. Saturday’s 10K was my final “Dress Rehearsal” where I would practice the opening 5 miles of the race followed by an easy 1.2 mile cool down back to the house. I picked the hill route that features a 1.6 mile climb out of the neighborhood up into Cat Hollow, then after a left turn a long downhill stretch that would mimic the opening climb to the top of the Verrazzano Bridge to start the marathon, then a second mile coming back down the other side. I wanted to run even effort, allowing the incline to drop my pace to around 7:10 min./mile pace, then lock in at goal pace at/around 6:52. As poor as my pacing was earlier in the week – I was dialed in just about perfectly on Saturday. 7:06, 6:51, 6:53, 6:56, 6:48 with a cool down 1.2 at 7:47 pace. An opening 5 miles like that in New York and we would start mile 6 just :02 seconds behind our exact goal pace of 6:52. Not too fast, not too slow – just about spot on perfect. From there we can evaluate things and determine if the pace is too rich for us or if the weather will not allow us to chase 3 hours. We still have time to adjust and run a strong, strong marathon. Shoot for sub 3:10 or even sub 3:05 and run a monster PR which will improve our seeding at Boston. If things feel smooth and easy we’ll run another 5 at the same effort and evaluate things at the start of mile 11. If I feel good at that point, don’t speed up. Run another 5. If I feel good after mile 15, don’t speed up. Run another 5. At mile 20 if we still feel like we have something left, don’t speed up. Run another 4. At that point with 2.2 miles left in the race it will be time to hang on for dear life and try to ride this thing out to the finish. But it all starts with that opening 5-miles when my legs feel fresh, the sights and sounds of the largest marathon we will ever run in fuel us on kicking up that adrenaline and making it tough to run with ourself. In some ways those opening 5 miles will be more difficult than the last 5 to stay on track and not make the most commonly repeated error in all of marathoning – going out too fast. There will come a time all too soon when “running easy” is not going to be enough – I’ll try to put off those “tough miles” as long as I can and when they arrive do my best to hang on. It’s a tough race the marathon, it takes a lot of confidence, patience and the right attitude to really “race” the distance. If you believe in signs or omens, then Saturday’s run was a good one. We’ll find out in 8 days what it all means. We’re now 10 days away from the 2011 New York City Marathon. The first look at extended forecast weather reports are starting to come into focus. Typically I don’t start thinking about the weather until Thursday before a Sunday Marathon as things will change quite a bit between now and then. No sense obsessing over something for a whole extra week when it is so very hard to predict what race day will be like this far in advance. For what it’s worth, they are predicting starting temperatures around 45 degrees going up to the low 60’s in the afternoon. Variable winds, 20% chance of rain. It does however look like there will be rain in the area on Saturday, so anything can happen on race day. As far as keeping up with your favorite athlete during the race itself, whether you want to track the elite men and women, yours truly or Apollo Ohno from start to finish you will have your choice this year between following along via a traditional web browser, a text message service or a tracking App that will be available through iTunes. My recent experience with the runner applications at the Boston, Austin and Denver Rock n’ Roll marathons have been spotty at best. But once again I believe that Dawn and I will give it a try so that she can keep tabs on me as I make my way from Staten Island to Brooklyn to Queens to the Bronx and on into Manhattan for the finish. 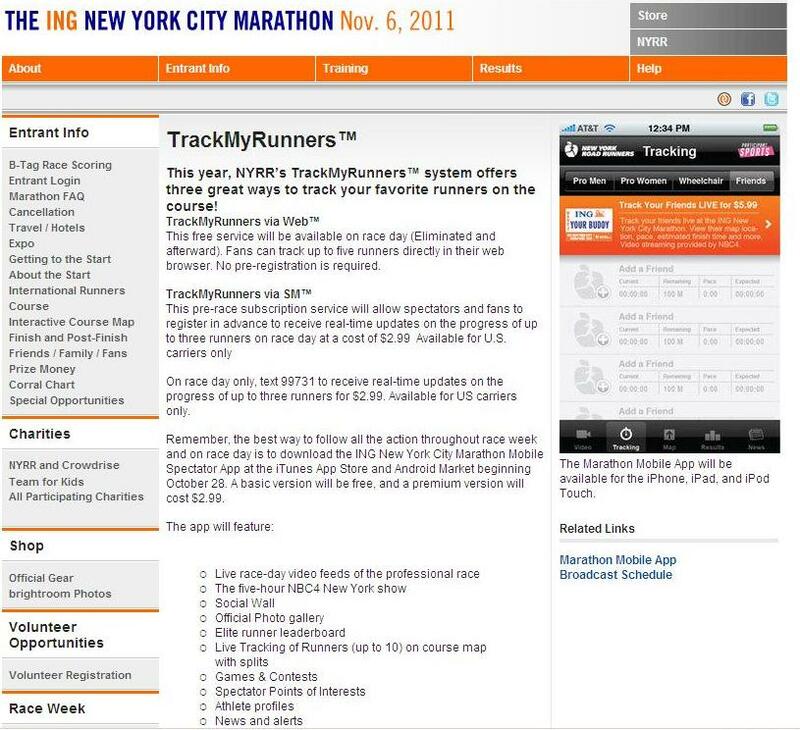 Click HERE to access the athlete tracking page on the ING New York City Marathon website. My start time will be at 9:40 a.m. as part of the 1st wave of marathoners to start the race. We are racing out of the Green Start area in corral 3. This is the first corral behind the elite local competitors in the Green Start Area. Corral 1 starts behind the 199 Professionals on the Blue Course. Corral 2 starts behind the 100 Sub-Elite marathoners on the Orange Course and then our group behind the 499 Local competitive runners (think sub 3:00 hour marathoners) on the Green. The Orange, Blue and Green groups run on their own route until the 8th mile of the race when the three courses merge into one. At that point the congestion of the mass start has subsided and all of the marathoners follow the blue line, painted the night before the marathon along the course to the finish. It appears that I will be off with about 3,000 runners at the start – making the marathon with more than 45,000 runners much “smaller” for me, which will be a huge positive. The hope is that I can find my rhythm early and easily and not spend a lot of time zigging and zagging looking for open space. If that does happen I am becoming comfortable with the idea of running a slow opening two miles up and then down the Verrazzano Bridge and not worrying about my splits until mile 3. Any time lost I will make up by conserving my energy until later in the race. If you are following along next Sunday do not be alarmed if I come through the half-way point in 1:32:00-1:34:00 – that is o.k., in fact that is what I am hoping to do. Running out front early and “banking time” is not the recipe for a fast marathon. Even, consistent splits over the first 15-16 miles is what I am going to shoot for – then over the final 10 miles when runners begin suffering, we are going to start doing our thing. Making up 2-3 minutes over 10 miles is nothing. If the weather proves to be favorable, you can expect our closing half of the race to be our fastest ever on the backside of a marathon. That’s the plan anyway. Of course this is one race where expecting the unexpected is part of the deal. 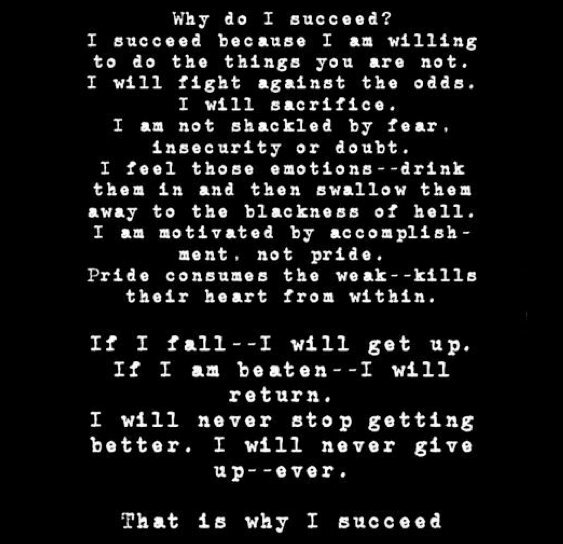 I’ve had a lot of people comment on the why I succeed “mantra” that I shared at the bottom of the last post. I will include a few of these throughout marathon week as we make our way to New York. I got passed on the trail this morning. Now, don’t take this the wrong way, there are PLENTY of runners in Austin who can hand me my lunch on a daily basis. Older runners, younger runners, men, women, kids – no doubt about it. With the exception of the Run for our Heroes Shadow Run 10K the summer before last where I came in first place overall – I am always passed. But over the last 3-4 years training on the Brushy Creek Trail behind our home I have never been passed, until this morning and it was a good thing. I left the house today upset at myself for running yesterday’s workout much, much too hard. I wanted to run something around 7:20-7:25 pace and I could not find my rhythm. No matter how many times I told myself, “slow down, you are going to hard” I couldn’t make myself do it. I ended up running the 8.3 mile loop at 7:07 pace. That might not sound like too big a deal compared to goal pace of say 7:20 on the fast end – but it is huge. :13 X 8 miles is a 1 minute and 44 second mistake. If I make that same mistake in New York in 10 days my race will be over before mile 15. That is a fact, not an opinion. O.V.E.R. So today I was determined to run my recovery workout as intended. 7:50 – 7:55 min./mile pace – not a single second faster. I left the driveway, locked in to easy pace and kept the needle right there. It was a struggle as my 7:56 opening mile “felt like” I was running closer to 9:00 min./mile pace – it was increasingly difficult to keep my legs from falling into a quicker cadence. I reined them in and kept ticking off nice smooth and easy miles one after the other. At mile 4 I reached the lake at Brushy Creek park and over my right shoulder I heard the crunching of the granite trail. As I looked to my right a young high-school aged runner slid past me and thundered away from me up the hill. For a second I thought about following, I may have even taken two or three strides before I came to my senses and I fell back into rhythm. “Let him go” I thought to myself. “You have far bigger fish to fry in 1o days”. And with that I focused on the trail in front of me and followed the route back to the house. 6.2 miles – 48 minutes and 55 seconds – 7:50 pace. I thought a lot about that young runner over the last two miles and how in New York I am going to have to stay within myself from start to finish. I will have never been in a larger race, even Boston and the crowds from Hopkinton to Boylston Street will not have prepared me for what I am going to encounter at the New York Marathon. I will need to remember the mantra that I have come to embrace for this race. “Run the course, not the mile”. Far too often in marathons I have caught myself obsessing about each individual mile. 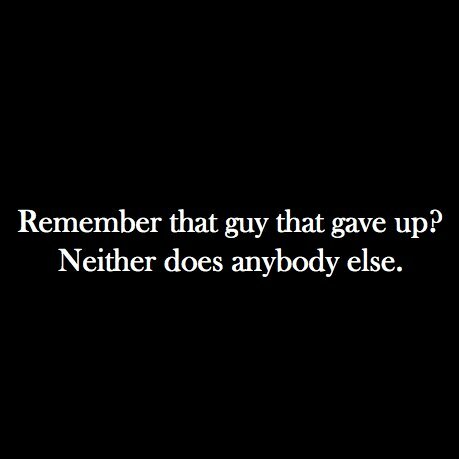 How many I have run to that point, how many are remaining. Did that mile feel better or worse than the last? Did I slow down? Was it because of the hills or am I bonking? What do I need to run this next mile at to get back on pace? Etc., etc., etc. Those are all negative thoughts, ones that once they creep inside the head of the marathoner, he or she is now battling more than just the course. They are now battling their own demons of marathons past, their own expectations for that race and the weight of their goal time can come crashing down upon them. Well not me. Not this time. I’m going to run the course, not the mile. Focus on where I am at that point and only at that point. The miles that are behind me are done – not a thing I can do about them. The ones that lie ahead I can only run one at a time. I’m going to run my race, block out the other runners who may be passing me by and keep running until I reach Central Park. At the park I am going to take an evaluation of how much gas I have left in the tank. I will be inside of the final 3 miles at that point and I am going to meter out my remaining fuel and energy so that when I reach Columbus Circle and all that remains is the final .20 miles I want to have basically nothing left. Running on fumes at that point when I make the final turn I am going toward the finish line I am going to summon the strength that somehow only comes to a runner when they are starting their final kick. In my best races I have run unafraid. Knowing that the last bit of energy, motivation and stubbornness would be there for me. As the legs churn faster than they have in hours, they oddly hurt less. It is like those legs who a few miles earlier were screaming in protest now decided that they too want to finish this thing. With a final stride it will be over. Hopefully the time will match the effort in New York and the accomplishment will match the expectation. Being passed on the Brushy Creek Trail 10 days before race day may have been the best thing that could have happened to me. Time to get the mind and the body right to run the race of our life. For the long-distance runner who is preparing for their first marathon, half-marathon or even a seasoned veteran preparing for an “A” race – the training plan becomes a huge part of their life. Every day for 3-4 months they look at the plan, think about their next workout, move around meetings, travel plans, meals and time with their loved ones all around the “Square” that reads – “Thursday – 10 miles, 6 at Goal Pace” or “Sunday – 20 Mile Long Run“. When Dawn asks me during marathon training, “Hey on the 14th there is a get together at Dave’s house on Saturday night, do you want to go?” the first thing I do is walk over to the refrigerator and look at the square for the 15th. What do I have the next morning? Can I move some things around or can I just go out and have some fun not worrying about what I’m going to eat and how much sleep I’m going to get. This goes on for 18 weeks until race day. You eat right, rest, take care of yourself and BOOM race day arrives. You race the best you can, suffer a little, cry a little, hopefully smile a lot post-race and then it’s over. In a way it ends with a giant thud. There is no more thoughts of “tomorrow I need to ….” – it just ends. A lot of distance runners go through symptoms very close to depression after the marathon. After weeks and weeks, months and months leading up to this HUGE event – all of a sudden it is behind you and there is silence. It can linger for several weeks until the runner either snaps out of it, finds a new distraction or what happens to most of us – signs up for the next race and the cycle begins anew. There is a solution however and that is to stake out your recovery plan long before race day. Create it just like you would your training plan and when you get back home after the race get right back into the habit of crossing off those squares. My post-race recovery training plan lasts 4 weeks and it takes me from the day immediately following my marathon up to my Sunday long-run 4 weeks later. Should I make it through the race “healthy”and by that I mean uninjured. I jump right back into my Recovery Plan. After taking three days off completely from running I will go out for a very short, very slow 2-mile run the Thursday following the marathon. The run usually goes something like this, “Ouch, ouch, ouch, ouch, ouch, ouch, ouch, ouch ….” you get the idea. But after about 15 minutes my body starts to loosen up and feel a lot better. Blood is back circulating to all the areas under reconstruction and the final 1-2 minutes of the run feel pretty decent. Instead of continuing on, I stop. I take my normal rest day on Friday to help my body get back into its normal rhythm and then I run shorter than usual and easier than usual on Saturday and Sunday. The following week I get back into my 5X per week running schedule, but again, at drastically reduced mileage and intensity. In a way I am “reverse tapering” – just adding mileage a little bit here and there – week after week so that at the end of this recovery period I am back to running a 12-mile long run 4 weeks after the marathon. At that point I am more or less “recovered” and ready to resume training. A lot of marathoners and coaches say that it takes one full day of recovery for every mile that you race. The concept being that if you race a 10K you will recover fully in 6-7 days. After a half-marathon about 13-14 days. After a marathon you would be recovered in 26-27 days. I think that is just about right. So if you want to get back to running safely, healthy and in a positive mental state than I suggest you plan out that 27-30 day recovery period just as you would the final 27-30 days leading up to race day. You might not feel perfect lacing up the shoes for your first few runs, but they are going to help you recover from your race mentally as well as physically. Happy trails everyone! 11 days to New York! Tuesday morning and for the first time since June my mileage for a Tuesday fell below 8.3 miles down to 6.2. The taper had finally arrived. Now when it comes to the taper there are a lot of different philosophies about how to best repair and prepare for marathon race day. Many coaches and athletes believe that a 3-week taper period that reduces your weekly mileage from its peak level to 75% in the first week, 50% in week two and then all the way down to 25% during race week. Now I’ve already shared my opinion on that schedule above and the fact that I have felt “stale” on race day with a three-week taper. I decided to go down to a two-week taper cutting my mileage to 50% this week and 25% next week, essentially training “as usual” up until two weeks prior to race day. The proof is in the pudding as they say, so we will just have to see how it all shakes out in New York, but as of right now I am happy, healthy and excited for race day. Usually I am starting to get stressed out at this point – wondering if I could have or should have done more to prepare. This time around I do not have those doubts – I feel locked and loaded and I am actually looking forward to the next 11 days to get the last lingering soreness out of my muscles and replenish my energy stores before race day. Cutting mileage is part of the formula for peaking without a doubt – but I think being smart about the intensity that your miles are run play an important role as well. For a marathoner who is hoping to run miles at 7:15 pace on race day or faster, running 8:30’s for two or three straight weeks is not the best strategy in my view. You want to have that muscle memory locked in so that when your brain says, “run 7:00’s” your body can get with the program. Being judicious about the number of up-tempo miles these last two weeks is the key. An injury at this point would be devastating. So that said I targeted two runs where I would run a few miles at and slightly below marathon race pace. Today – on our typical Tempo Tuesday workout and a few miles on Saturday morning 8 days before race day. So today, after moving my run later in the morning to closely mimic the 9:40 a.m. NYC Marathon start, I took off over the hill route for a progression run, where each mile would be run with a slightly greater intensity starting :15 or so slower than marathon goal pace and finishing just a bit above half-marathon race pace. 7:06, 6:58, 6:48, 6:50, 6:43, 6:32. Just about perfect, only the fourth mile that took me up and over the dam fell a bit slower than the previous mile. As serious as I took today’s workout and this entire marathon training cycle itself I had a moment of clarity last night. In the end what happens on November 6th is not going to define me. I’m a marathoner and a relatively decent one. I’m not going to win any awards or prize money in New York. I’m not looking for a new shoe deal or a sponsorship. I’m going to place more than likely between 1,200th and 1,500th. Just a blip on the big screen in Central Park. Just one of many, many thousands. But last night, to my little daughter Landry I was number 1. With her Mommy out of town this week on business, it is just me and Land until Friday. Bottles, diaper changes, dinner, bath time, story time and hugs and kisses – all Dad. When she woke up at 4:03 a.m. and needed to be rocked back to sleep I snuck into her room, scooped her up and laid her in my lap. 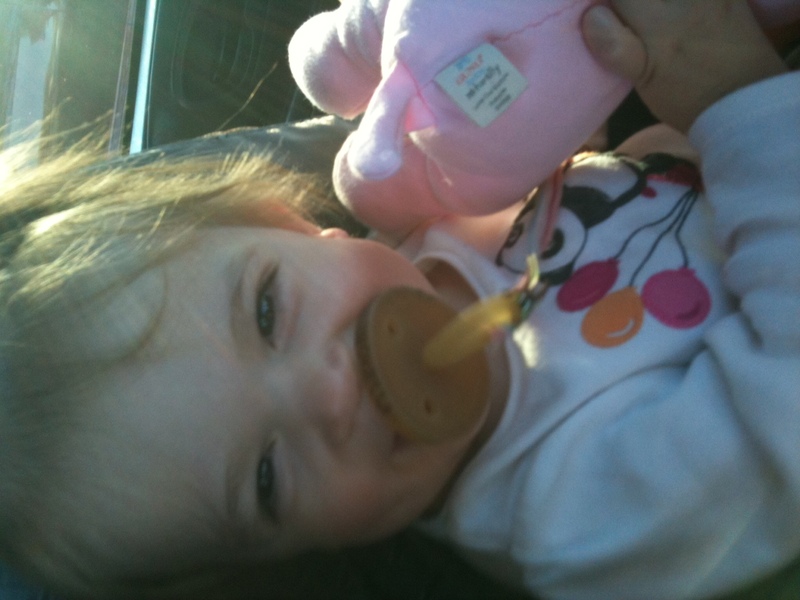 She ran her little fingers up and down the hair on my arms and drifted back to sleep. Dreaming the dreams of a precious little girl. I wasn’t 1 of 1,200 or 1 of 12,000 – I was one of one and that is what it is really all about. Being a Dad, being a Husband – those are the things that will last. Next Sunday? Who is really going to care how fast we run or how many minutes I either make or miss my goal time by? The best part of the day is going to be seeing my wife and my daughter long after I’ve crossed the finish line – getting a big hug and kiss from both of my girls and transitioning back from Marathoner to Dad. It’s the best gig in the world. Marathoning takes a lot of self-discipline, of that there is no question. Whether it is making sure that you eat right and take care of your body’s increased and changing needs, making it out the door in otherwise horrible weather conditions or just simply sticking to that plan on your refrigerator door and knocking out workout after workout no matter how much you would like to stay in bed. 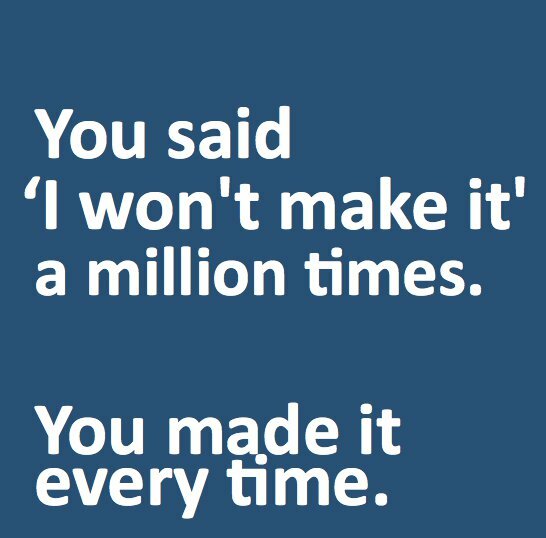 The marathon in a way is about stubbornness. 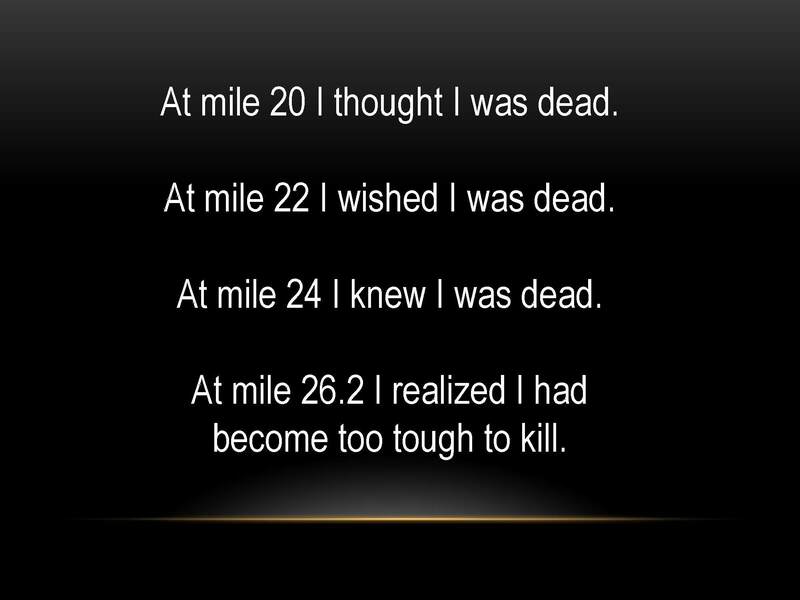 Our bodies are not meant to run 26.2 miles. That’s not an opinion, that’s a fact – otherwise we would be configured in such a way that we could store enough fuel to cover that distance. The act of training for the marathon is one of perseverance and coping skills. You are teaching your body to function differently than intended as well as convincing your mind to carry on when the natural responses are telling it to slow down and conserve its energy sources. Not giving in and continuing forward puts the “challenge” in the marathon. It is one of the things I think of first when I meet a new runner and they tell me that they have completed a marathon. Automatically I realize that we have a shared experience. They have been to the same edge that I have been to and they didn’t let the race defeat them. In a word, they are stubborn – just like I am. What I have come to realize over the course of training for my last two marathons is that it is equally important, perhaps more important, to remain somewhat flexible in your approach to your training program as it is to blindly tick off workout after workout never asking yourself if this is the right thing to do “today”. There are sure to be workouts that show up on your carefully crafted 18-week marathon training schedule that was put together 2-3 months earlier that simply do not fit the bill for that particular morning. A tempo workout scheduled 10 weeks in advance may or may not be the best idea coming off of a particularly hard long run the previous Sunday or a day in which you feel a sore throat coming or have a lingering cough. Now I would not be completely honest if I said that there were never days when I simply “cowboy up” and run the scheduled workout as planned no matter how I am feeling. Yes, there are times when I know that the hill repeat session I have on tap for that morning is going to be a tough workout, but I know I can get through it – and because it fell on a day when I was not feeling 100% – it may just do me even more good in my training than it otherwise would have. That’s the part where stubbornness can be an asset. But there are other times when you simply need to exercise some caution, move some things around and decide that moving that Tempo workout up in the schedule so you can run it on your home course before a work trip makes sense. Or shifting hill repeats up two days so that you can recover in time for that 10K that you decided to race as a tune-up on Saturday. These are the choices that help you get the most out of your training cycle – and just because Hal Higdon, Pete Pfitzinger or Jack Daniels says,“11 miles with 5 at goal pace on Wednesday morning”, that does not mean that you can’t take some creative license with your training plan and make some adjustments. It is YOUR race afterall. Take ownership in the preparation for that race so that when you toe the line at the start of that marathon, you know in your heart that you did all that you could to prepare the best that you could for that race on that day. Today I begin my taper for New York and I thought it was a good opportunity to look back at my original training plan that I created back in June and compared it to the actual mileage, workouts and races I completed on my way to the starting line in New York. For the most part I stuck to my schedule, hit my workouts when I had them outlined and stayed the course. But there were a few changes that I made mid-stream so to speak that I think made a good training cycle a great one. I added an open water swim/run the week before my first triathlon to gain some open water, swim in a crowd experience. It was invaluable even though it required me to reduce my morning run from 8.3 miles that day to 6.2 miles and race 1.9 miles that night. The week of my triathlon I decided to skip my Thursday run and instead bike and swim. It reduced my run mileage by 8 miles that week, but the 15 mile bike and 2,250 meter swim made me more confident for race day that weekend. I added a Labor Day 10K running on a Triathlon Relay Team at this year’s Austin Triathlon. It increased my run days that week from 5 to 6, so I decided to run long on Friday morning and shorter on Saturday so I could take Sunday off to get ready for the race. My mileage stayed the same, but I changed the order of the two workouts to make sure I was ready to give a quality workout on a Monday – a typical rest day for me. I decided to race the IBM Uptown Classic one week before the Denver Half-Marathon, meaning I would have three straight race weekends in the middle of marathon training instead of 2 in three weeks as I had originally planned. It resulted in a new 10K PR at IBM and a great confidence boost leading up to New York. It was in fact the best technical race I have ever run. Because I was going to be racing three straight weekends in late September – early October, I decided to add 16 mile long runs on Tuesday morning after the SI Labs Marathon Relay and the IBM Uptown Classic. Both races were 6.2 mile events held on a Sunday where I would have normally had 18 mile and 20 mile long runs scheduled. By adding two 16 milers instead of a typical 8.3 mile Tuesday workout – I was able to keep my mileage up and not “peak” too early – protecting my actual taper period where a reduction in mileage will allow my legs to snap back and have a lot of bounce for race day in New York. I also “tacked one on” here and there throughout the course of my marathon training cycle making a scheduled 16 miler in fact 17 miles or a mid-week medium long run 12 miles instead of 11. I did this judiciously, making sure they were not after a particularly hard workout the previous day, but I did this fairly often, increasing my daily mileage totals. 3. I skipped a workout when needed. A lot of experts will tell you that if you are able to run 90% of your scheduled workouts you are going to be just fine for race day. That a nagging injury, soreness or illness will invariably rear their head at some point during your training cycle and that you are better off just skipping that workout than trying to run through it. Even worse is the idea that you “owe” that workout to the training cycle and you should go out and run it on an off-day or combining it with another “easy” workout. Missed training days are simply missed days. It is smarter and better for you to just take the extra rest day and move on with your schedule. Through Sunday I had 89 runs or races scheduled and I was able to make 88 of them. On Thursday, July 14th I had been fighting a cold and had a slight fever. By missing my workout I would have back to back days off combining Thursday with my Friday rest day. Skipping the workout and getting some extra sleep was the exact right call. I rebounded quicker than I would have otherwise and ran my scheduled 8 miler on Saturday and my 17 miler on Sunday. In the grand scheme of things those 8.3 miles I missed on the 14th of July amount to a single speck of sand on a beach. I am no worse for wear and in fact I may have jeopardized even more workouts by trying to push through the onset of illness. So when all is said and done we will have run 96 out of 97 workouts if things go according to plan over these last two weeks amounting to 948.35 miles. Compared to our original training schedule – that is an increase of 8.11%. But even now I am still listening to my body and making adjustments. Normally on Tuesdays I would run an 8.3 mile recovery run after yesterday’s final 20 miler. But given the fact I am only tapering for two weeks instead of a traditional 3, I am going to reduce each run this week by 2 full miles, making tomorrow morning’s 8.3 mile easy run an even easier 6.2 mile loop. I am going to run by feel, leave my watch on the counter in the kitchen and in fact, I may not wear my GPS watch again until my Saturday shake-out run prior to the Marathon on Sunday. All the work is done. Now it’s time to get my body and mind right and prepare to be one stubborn son of a gun on November 6th. I’m not going to cede a single inch on race day – just strap myself in and fight for every second. I only have 10,800 of them after I cross the starting mat in New York City to make my goal time. I’m going to need every one of them.